If there was only one restaurant in Washington DC that you could eat at, the place to go to is Dangerously Delicious Pies. They serve both savory and sweet pies, and they are absolutely to die for. I bake my own pies, and so am a pretty tough customer when it comes to eating pies. But these pies are not only up to par, but I go out of my way to have one. Dangerously Delicious Pies started out in Baltimore MD, but they now have several locations. I go to the one in Washington DC in the H Street corridor. The H Street corridor is an up an coming neighborhood in DC with a lively bar scene and plenty of colorful restaurants. I usually get there by taking the X2 bus from Chinatown, but you can also take the Street Car from Union Station, which is free. In either case, you get off near the intersection of 13th and H. They now have a location in Chinatown which is easier to get to. But not nearly as fun. The flavors of pies available vary, so you look at the board to see what they are serving. I try to order a different pie each time I am there, but I do have some go to pies. My favorite savory pie is the SMOG. This is a meat pie made from Steak, Mushroom, Onions, and Gruyère cheese. It is the perfect blend of ingredients, and the pie guys execute it masterfully. On my most recent trip, I got the Ratatouille. 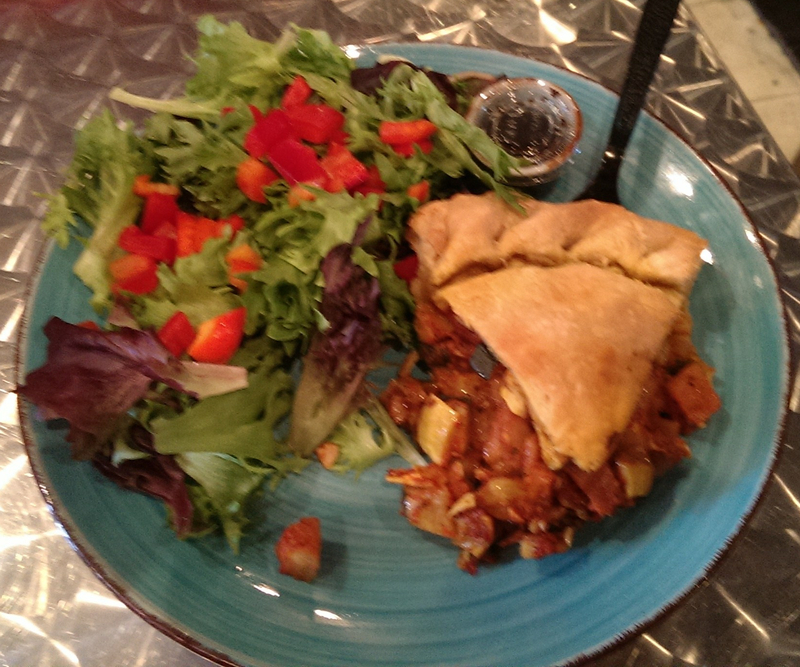 As the name suggests, this is a pie made from roasted vegetables. This is chock full of vegetables and quite hearty. But I did find myself missing some meat. I also have a favorite sweet pie: the Baltimore Bomb. It is based upon the quintessential Baltimore cookie, the Berger cookie. Berger is a rich shortbread cookie that is dipped in chocolate. The Baltimore Bomb is simply a pie filled with these cookies and baked to gooey deliciousness. The result is absolutely fabulous, completely unlike any pie I’ve ever had. This time around, though, I has the Mobtown Brown. Mobtown, it turns out, is a nickname for Baltimore. 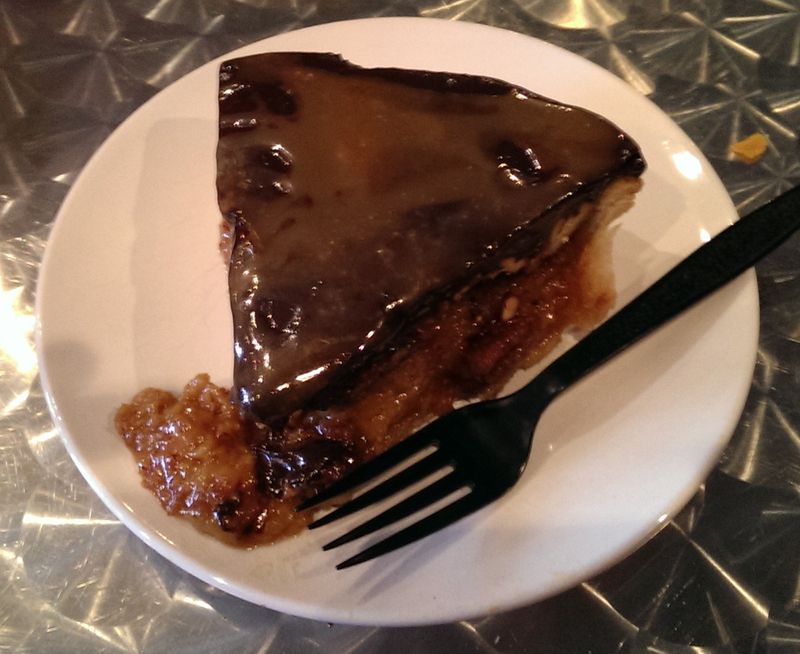 The Mobtown Brown starts as a pecan pie topped with a layer of ganache. That’s not enough though, so the ganache is topped with a brown caramel sauce. It is extremely decadent. And extremely delicious. So if you are ever in DC and have a little extra time to spare, I urge you to track down Dangerously Delicious Pies and have some of the best pies around.